In a very real sense, the humble adobe brick made the California missions possible. Although other building materials were used when available – wood for doors, roof frames, and outbuildings, or stone for chapels – adobe was available almost everywhere. Adobe had the additional advantage of being cheap, although making and building with adobe bricks required a great deal of labor. 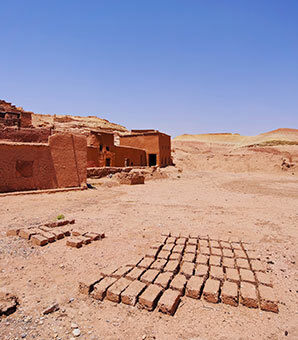 Adobe bricks were made by combining naturally occurring clay with sand and organic material like straw or dung to bind the bricks while drying. The adobe mixture was pressed into simple wooden forms to form bricks, which were then dried in the sun. The bricks could be used to build thick, strong walls that helped to keep the mission buildings cool in summer and warm in winter. The bricks were joined together with adobe mud, or with lime mortar made from limestone and seashells. Because the bricks could be dissolved by water, the walls were protected from rain by coating them with plaster (made from sand and lime), or more adobe (which needed to be refreshed regularly). Mission architecture also featured roofs that extended well beyond the walls of the buildings, providing shaded walkways, and also providing additional protection for the walls. Adobe bricks, drying in the sun. The adobe clay could also be forms into roof tiles and baked in a kiln (a specially built oven that could reach high temperatures). When baked in the kiln, the adobe tiles vitrified into true ceramics, and became strong, durable, and water proof. Adobe roofing tiles were fired in a kiln to become strong and waterproof. Overlapping tiles prevented rain from penetrating the roof. Not all of the missions had the skills or materials necessary to produce baked adobe ceramics. Those that did often produced roof tiles, floor tiles, bowls, jars, and cups, which they sold or traded. According to records at the time, the first roofing tiles were made at Mission San Antonio de Padua. Mission San Luis Obispo further refined the process. At San Luis Obispo, horses were kept walking in circles to mix the adobe clay with their hooves. Some of the missions even used adobe pipes to carry water for irrigation. Although adobe construction was essential to the growth of the mission system, it also a serious drawback. Adobe does not hold up well in earthquakes, and many mission structures were destroyed by earthquake damage over the years.